Since 2007, Joyetech has released some of the best box mods on the market; year after year and device after device, Joyetech creates products that are not only exceptional and ultra reliable in their own right, but also set a new standard for competing manufacturers to strive to match. Additionally, not only do they continue to set precedents with their newly released devices, but they also continuously update and upgrade their previously released models in order to maintain highly competitive technology in today's e-cigarette and APV marketplace. 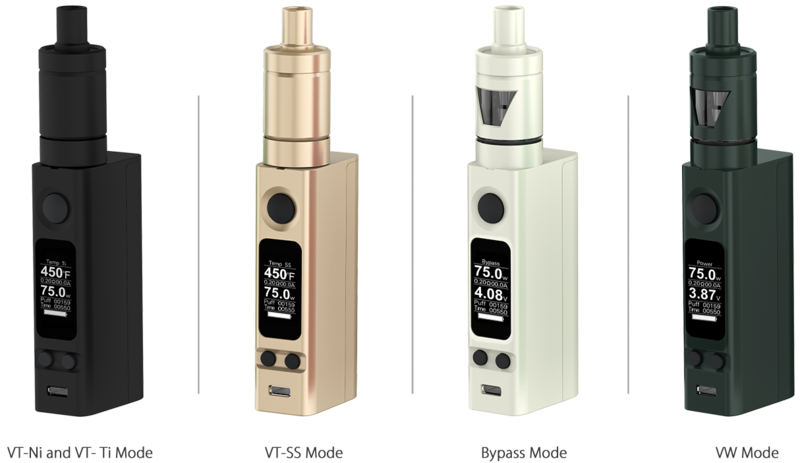 The Joyetech eVic-VTC Mini 75W Kit is the marriage of two such extraordinary devices, the eVic-VTC Mini 75W and the Tron Sub-Ohm Tank. Together, they create a fully featured bundle of devices both previously seen and previously unseen that are ideal for vapers interested in the latest technological advances available. The Joyetech eVic-VTC Mini 75W utilizes the latest firmware for a generous bump in wattage from 60W to 75W. Additionally, the eVic-VTC Mini 75W maintains the same features that brought the previous model to greatness, including complete temperature control for Ni200 and Ti wires, but now supports the use of SS wire, opening the door to a world of possibilities in building and vaping. In addition to the variable wattage and variable temperature mode, there is also a very functional and useful bypass mode, which allows users to bypass the chip and vape solely on the voltage of the battery itself, allowing users to wiggle past the wattage limits of the chip. The eVic-VTC Mini also has an upgraded OLED display with even more information about your vape readily accessible at a moment's notice. The micro-USB charging port is side-embedded, making for a no-hassle charging experience without the need to awkwardly place your device in order for it to charge. Of course, if you're looking for a reason to use your external charger, the single 18650 battery (sold separately) powering the device from behind the magnetic battery bay door is easily removed and replaced. The next device included in the eVic-VTC Mini 75W Kit is the Tron Sub-Ohm Tank, which comes in two variations: the Tron-T and the Tron-S. A very uniquely designed device that takes the aesthetics of your vape setup to new heights, the outer body of the tank features a slick and fashionable cutout for visually checking how much deliciousness is left in the 4mL tank. 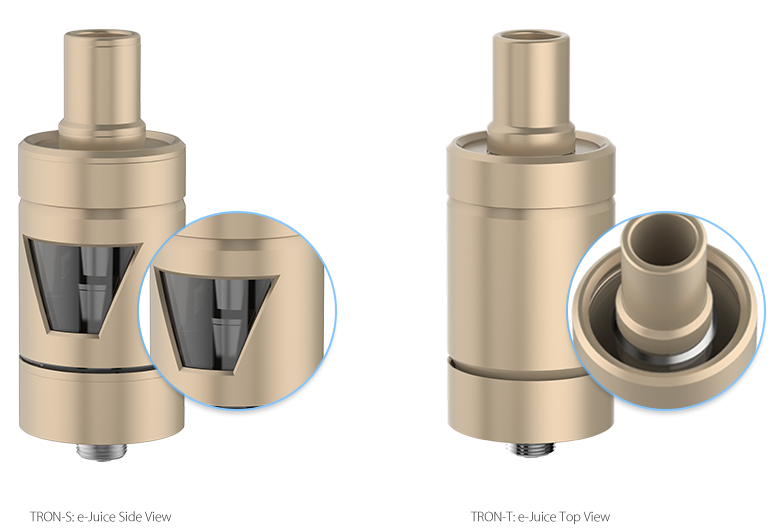 On the Tron-S, the juice level is viewed via a stylish V-shaped cutout in the side of the tank; on the Tron-T, the juice is seen through a stealthy cutout in the top of the tank with the exterior left solid for an ultra slick appearance. And when combined with the fully adjustable airflow hidden behind the lower portion of the outer body, it creates a very sleek and svelte visual aesthetic. 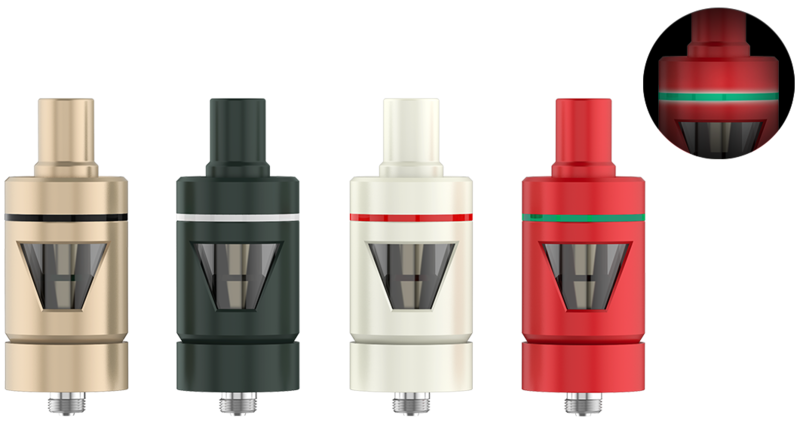 The Tron Sub-Ohm Tank accepts all of Joyetech's CL replacement heads, which come in many variations of heating elements and building styles: CL, which uses kanthal; CL-Ni, which uses Ni200, a nickel alloy; CL-Ti, which uses Titanium; the CLR, which allows users to build their own coils for infinite customization; and many more. The eVic-VTC Mini Kit conveniently includes one of each of the kanthal, Ni200, and titanium atomizer heads, allowing the user to find out for themselves which material they prefer. The Tron also comes with four colored silicone rings to make the tank all yours (one even glows in the dark, which is always awesome). Joyetech has prided themselves in releasing numerous devices that take the industry by storm each and every time they hit the market, prompting vapers old and new to make a mad dash for the latest Joyetech product, and they can maintain that pride, as they've done the same with the eVic-VTC Mini 75W Kit. This collection of incredible devices and features includes virtually all you need to start vaping incredibly. Find out for yourself how great vaping should be with the Joyetech eVic-VTC Mini 75W Kit.